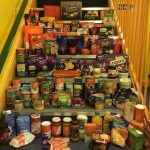 From all of us at Busy Bears, we would like to say a huge thank you once again for all of your support with our Foodbank Appeal. The Local Authority have recently released figures that highlight 25.5% of families living in Durham City & 26.8% of families living in North West Durham as being families living below the poverty line & in need of additional support with living costs. We have been over whelmed with donations from our families and we are hoping this will go a long way to making Christmas magical for some of these families. All donations will be provided to local drop off points around the area.